신혜성의 목소리로 듣고 싶은 노래를, 듣고 싶은 이유(또는 사연)&apos;와 함께 신청해주세요. * 신청곡 응모는 캠프 참가자, 비참가자 모두 자유롭게 참여하 실 수 있습니다..
* 여러분이 남겨주신 신청 메시지는 캠프 코너 중 MUSIC SHOW에 사용될 수 있음을 사전에 알려드립니다. Hyesung will sing your story! 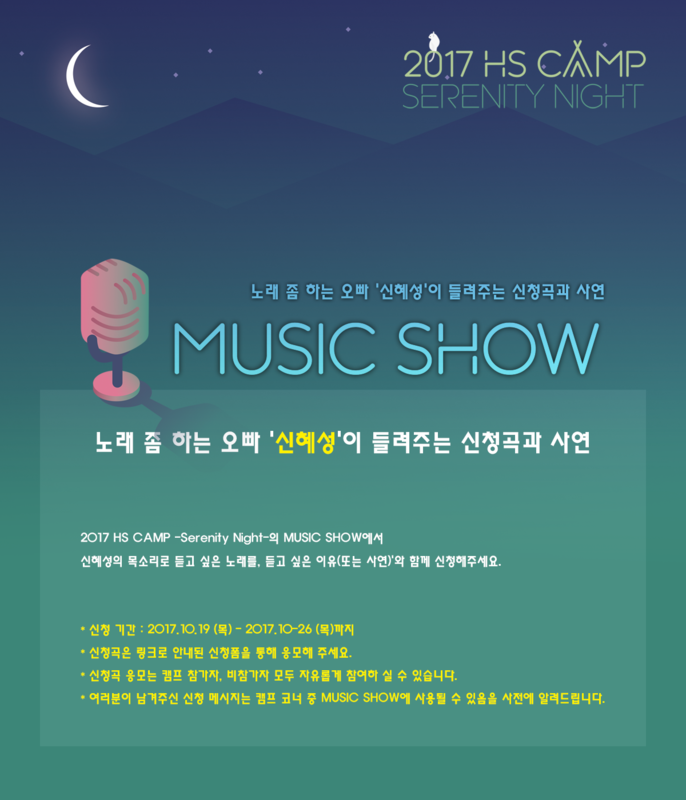 Please request a song that HS will sing at 2017 HS Camp – Serenity NIGHT – Music show! Send us your special episode and a song which you want to listen! * Your story would be read at the music show of 2017 HS CAMP.